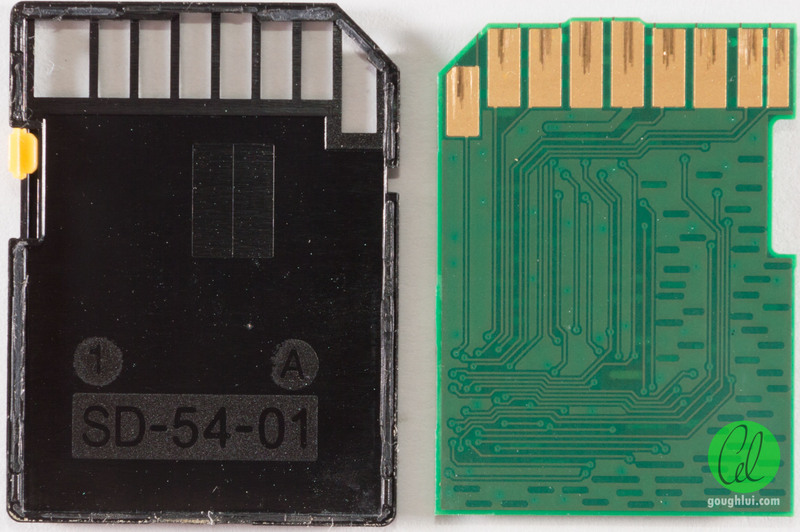 A while back, I posted a gripe article about how I disliked some aspects of the Secure Digital memory card format, one of the issues being the fragility of the plastic shell. Through no fault of my own, it seems it has happened to one of my largest cards. Damn. My Kingston 128Gb card is the largest that I own today, and I tend to keep it safe and away from harm. This includes preferentially using smaller capacity cards to do the frequent back and forth dumps, as well as using plastic flash card cases to hold it. As it turns out, the plastic case I was using was a little tight, and was “squeezing” the card along its ends. After a few inserts and removals, the halves of the case began to separate … and so we end up at this unintentional teardown. The disassembly part of the teardown was taken care of by the tight plastic card “case”. Its pushing against the ends of the card led to the halves of the case separating – the case itself is only secured by a bead of adhesive around the perimeter. The positive of this is that the thin plastic casing was undamaged, unlike when such issues are caught too late, and thus a full repair is feasible. The card itself mainly consists of three chips – two flash memory chips marked FA64B08UCT1-7C S1339-2603773. This marking seems to be only used on flash drive products from a Google search, and doesn’t reveal who the manufacturer of the flash is. As a result, it could even be lower quality flash, and or TLC flash from unknown parties. It seems it is likely manufactured week 39 of 2013 based on the laser-etch code. The third chip is a PS8035-0 controller from Phison. The rear of the PCB, as expected, contains no components. The mould code can be seen in the rear segment. A repair of a broken SD card is conceptually simple, but some care is required. For one, we shall be using superglue (aka cyanoacrylate). The key is to not apply too much, and to apply it precisely. You wouldn’t want to have to toss a card because you chose a bad $2 bottle of glue. For that reason, I did make a trip this week to Bunnings and picked up a Loctite branded “precision” 5g bottle of Superglue. This would be handy for other repairs as well. I began first by applying four small drops of glue to the rear mold plastic so that the PCB can also form part of the “assembly” and hold the unit together. Then, I placed the PCB on top, and carefully pushed down evenly to spread the glue. Then for the top-side, I decided to apply a thin bead of glue around 80% of the perimeter of the top side lid, and then apply a drop of glue on top of each of the flash chips so they can also participate in strengthening the card itself. Carefully, I picked up the top lid by the edges, aligned it and then squeezed both parts together. It was satisfying that my fingers weren’t glued together, and only a tiny excess of glue can be seen at the seams. Some time was allowed for the glue to set, and then the repair is complete. One relatively expensive card is fixed by a few dabs of glue from a premium bottle of superglue. The key is not to put too much glue, and to put it in the right places. Another big tip is to repair it as soon as it seems like it’s falling apart, so the case doesn’t break any further, otherwise a full repair could become impossible. 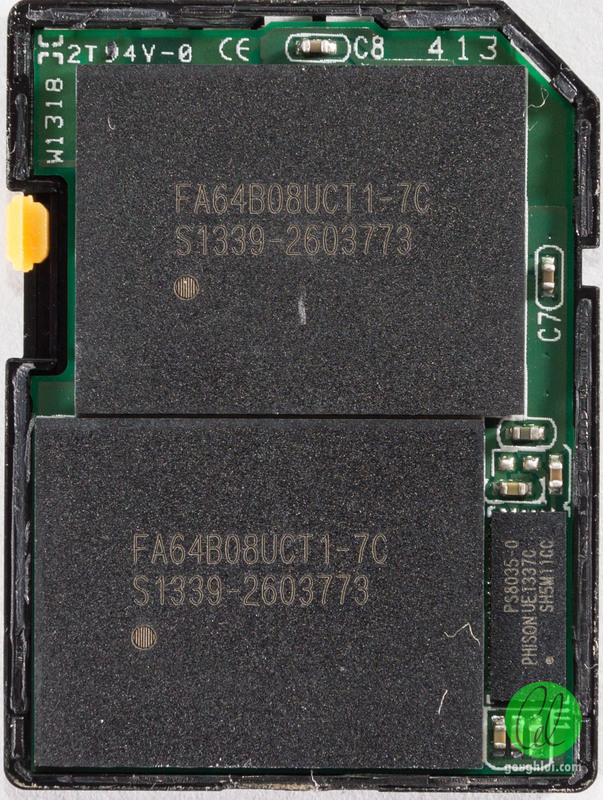 This entry was posted in Flash Memory and tagged flash, flash memory, repair, teardown. Bookmark the permalink. I wanted to ask if you had experience with card readers that are supposed to make computers read memory cards like this. The reason I am asking is because I have an Intel BH67cl motherboard that destroys these readers. I have like more than 10 card readers. They will work for like a little bit, as little as a few hours or maybe a few days but then stop working. Some of these card readers I had used with my older computer for months without problems. It has done this to every card reader I have tried. I used a cheap card reader in the car to play mp3 music but I took it to change some of the files and it stopped working in the middle of copying a few files. Another one bites the dust but it had worked in the car for like an year. I tried Google but don’t really know what even to search for. Oh I had a Kingston 4 gb pen drive that worked for years until I lost it. But the 32GB PNY pen drive I got a month ago stopped working in 2 days. I was using it in the USB2 hole since there is no USB3 support during boot up. Not sure what the problem is with USB2 ports.. would think Intel would have a good port as they designed it. I’ve never had persistent problems like that, and none that ever caused permanent damage. I did have some frustrations when I was using a worn out front panel port that had intermittent contact issues, or using “off board” cards like VIA chipset USB controllers which are troublesome. Some old Nvidia Nforce2 chipset USB ports also caused me issues but that was due to quirky USB implementation. I’ve never had any persistent hardware-destroying computers. Maybe you should check the power supply – maybe it’s putting out excessive noise/voltage spikes causing damage/misbehaviour, or maybe it’s just a bad motherboard with an internal short somewhere that intermittently applies 12v to the 5v lines. Maybe you have a low quality powered hub that’s back-feeding electricity to the computer with a bad power supply on that. Or maybe there’s a grounding issue somewhere, or maybe even static damage during handling USB devices (although the latter is more doubtful). Sadly, there doesn’t sound like an easy way to troubleshoot these issues. Glad you repaired your SDXC card , on the other hand I am also glad you had this unintentional tear down as I have wanted to the see the insides of these modern SDXC cards as it is interesting to see what controller they use. Regarding the flash memory module , have you tried running Chip Genius on the card ? It can sometimes give you info on the manufacturer of the chip and the type of NAND …. As far as I can tell, Chip Genius cannot really find anything, mainly because it was designed for use with USB flash sticks. If you can determine the chipset, and use manufacturer’s tool commands, you will be able to determine the flash based on the ID code because the flash is directly connected to that chipset. In an SD card, you would interface it to a computer using a USB-connected reader which “hides” any direct access to the chipset of the card itself. Even if there was a direct hardware access to the SD card itself, the software would still have to be able to query the Phison controller used in the card, and support for manufacturer’s commands on SD cards seems unlikely. What about using an internal SD card reader such as ones inbuilt to laptops? Again, this highly depends on how the internal slot itself was constructed. Most of them are merely permanently attached USB readers with Realtek or ENE chipsets (common from the Netbook days). Others are adaptations to other buses – the problem being the chipset will not provide emulation of the hardware level access necessary to read the CID/CSD data, which in itself, will tell you about the card’s controller configuration but not the flash itself. Some chipsets may have diagnostic modes but that requires a knowledge of these chipset-specific commands and coding your own application to access them. There are hardware-based SD slots, and these are more common on ARM and Atom SoC style chips. Unfortunately, for those running Windows, I can’t find a way to access the data using OS tools even if there is a hardware SD bus that provides the access necessary. Maybe someone can code up an application for this, for Windows 8 and above tablets. But where you have say, an Android device, or a Samsung ARM Chromebook hacked to run Linux, it is very simple to read the CID/CSD data as it’s native. Mr. Gough, what is the final destination of electronics related fields? I looked up the NAND Flash part number and found some information, including a hexadecimal identifier string (0x98 3C 95 93 7A), and used a Toshiba datasheet to make sense of it. 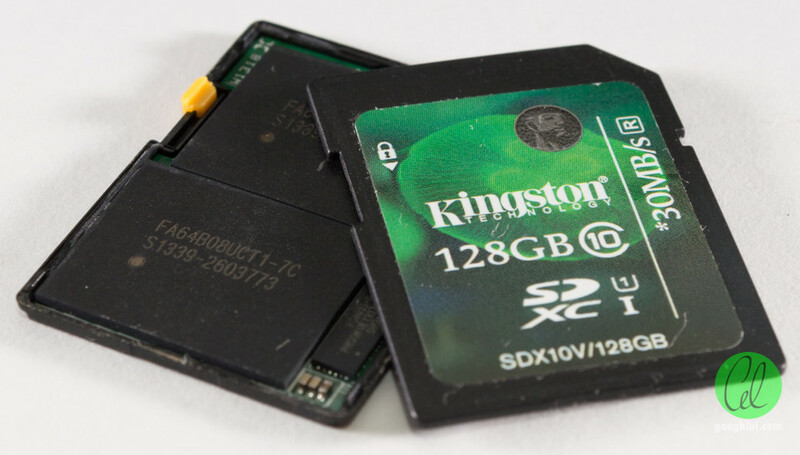 Thankfully the card uses MLC Flash, but the large page and block size likely doesn’t do the SD card controller any favours when it comes to small-block performance – but not like that controller was strong in that area to begin with.